A key issue in economic discourse today is the relation (or lack of it) between economic behaviour and morality. Few (presumably) would want to deny that human beings are in some sense moral or ethical creatures, but the devil is in the detail. Should we think of economic behaviour as an essentially amoral process - a process adequately characterised by a means-ends rationality - into which any number of subjective ethical concerns or orientations may be intruded to give a particular action its determinate moral content? Or is it rather the case that our moral being runs deeper than this, in the sense that all of our behaviour - `economic' or otherwise - is enabled or capacitated by a competence that is fundamentally ethical in character? With new analyses of the work of Hobbes and Smith, Dixon and Wilson offer a fresh approach to the debate surrounding economics and morality with a novel discussion of the self in economic theory. This book calls for a change in the way that the relation between economic behaviour and morality is understood - from an understanding of morality as a kind of preference that informs certain types of other-regarding behaviour (the way that modern economics understands the relationship), to an idea of morality as a competence that enables or, rather, conditions the possibility of all forms of human behaviour, other-regarding or not. 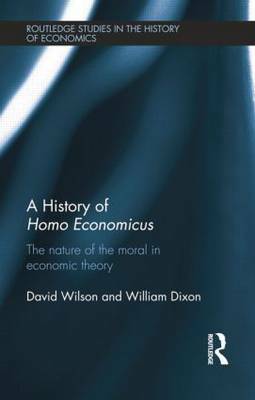 Offering a new insight on homo economicus, this book will be of great interest to all those interested in the history of economics and of economic thought.